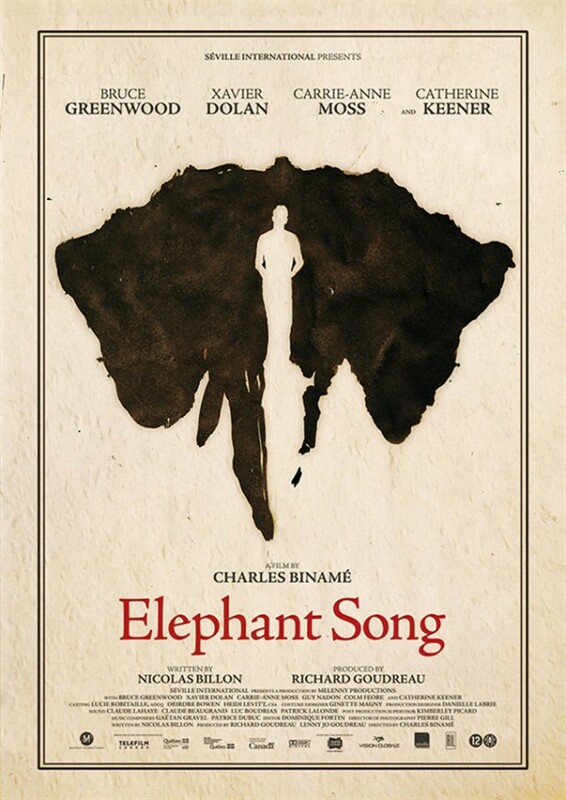 Elephant Song, the stage adaptation from director Charles Binamé, tells the story of veteran psychiatrist Dr. Toby Green (Bruce Greenwood) who’s tasked with getting to the bottom of the disappearance of one of his colleagues, Dr. Lawrence. The only trouble is, the key to finding out exactly what happened to Dr. Lawrence seems to be Michael (Xavier Dolan), a young patient in the psychiatric ward, and so the stage is set for a lengthy meeting between Dr. Green and the increasingly tricksy Michael. It’s in Dr. Lawrence’s office that most of the drama takes place, with Michael gradually feeding Dr. Green a trail of crumbs. There are a few deviations into Dr. Green’s home life, mostly focused on his sister (Carrie-Anne Moss) and his young disabled daughter, but there are also moments dedicated to exploring his past marriage with one of Michael’s nurses, Mrs. Peterson (Catherine Keener). Then there’s a framing interview narrative retracing the key moments of Dr. Green’s interview with Michael. You get the feeling that Nicolas Billon (writer – adapting his own play for the screen) made these additions to the central encounter to help justify Elephant Song’s place on the big screen. But, it’s the stage-friendly Green/Michael two-fer that really stands at the heart of the film. Greenwood is very strong as the experienced practitioner trying to take on Michael, his most difficult case yet, and he really delivers when Michael starts to tweak a raw nerve. Dolan, however, is given a decidedly less subtle role to work with. Dolan’s performance, and much of the writing for his character, plays off of the age-old Hannibal Lecter, genius psychopath archetype and most of the character writing fails to bring anything all that new to the table. There’s a lot riding on these performances and Dolan, while admirable, is where the film slacks. He’s not helped by the framing narrative, which paints Michael as an enigmatic figure. Lots of ‘if you’d met him, you’d understand’ lines set the bar unattainably high and the character just feels somewhat lacking in reality. Things do change however and, as the mystery shifts from Dr. Lawrence to Michael himself, the character starts to come into his own, as does Dolan’s performance. That being said, Billon seems to be taking the opportunity to draw attention away from the central disappearance mystery and its lacklustre reveal. There’s a solid mystery at the heart of Elephant Song but it’s never delivered upon satisfactorily as the attention is shifted onto Dolan’s character. The film also suffers from being a seemingly unnecessary adaptation. I haven’t seen the play, but there’s very little here that couldn’t have been achieved equally well on stage. That results in Elephant Song being an interesting watch, but far from a necessary one. This review was originally written for Close-Up Film and the film is out now on DVD and VOD, in the UK. ← 20,000 Pageviews – How to Celebrate?